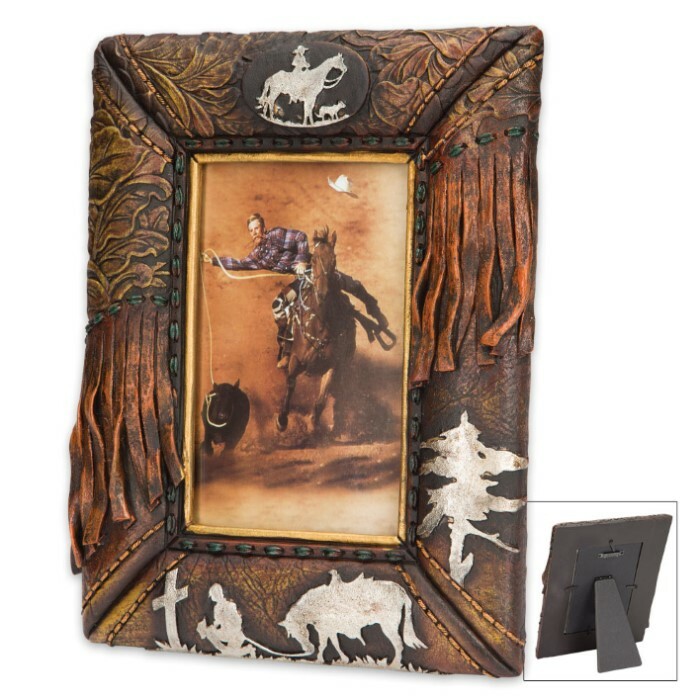 Praying Cowboy Antiqued Western-Style Picture Frame - Fits 4" x 6" Pictures | BUDK.com - Knives & Swords At The Lowest Prices! 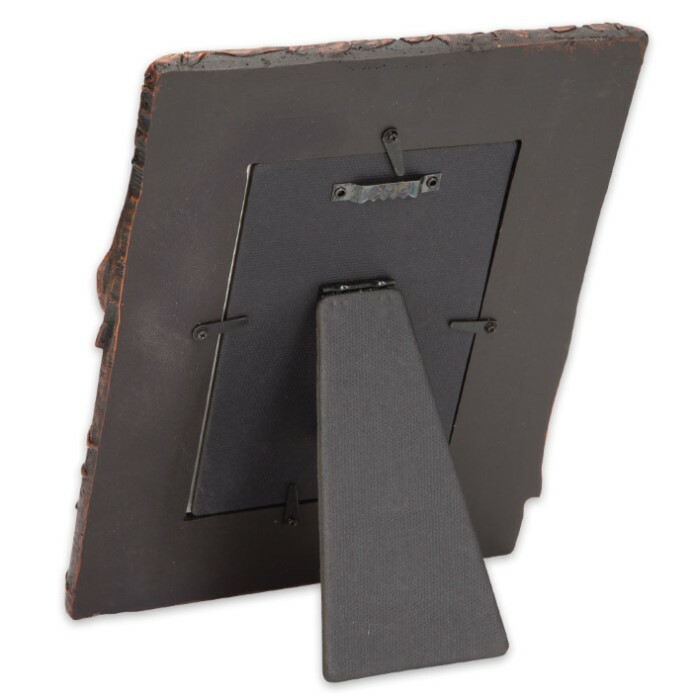 Delicately antiqued and exquisitely rustic, this 19th century-style frame enhances any cherished 4" x 6" photo, while safeguarding the treasured memories therein. It also melds seamlessly with any home decor theme, adding a sense of pastoral grace and country charm. The attention to detail in both design and craftsmanship is nothing short of spectacular, featuring a vintage profile accented with elegant embossed floral patterns and bathed in a warm, rich patina. Brilliant silver-colored silhouettes of horses and cowboys encircle the rectangular photo window, beautifully offsetting the frame's majority soft, dusky hues. The cowboy below the window kneels earnestly in prayer before a like-colored cross, and a distinctive leather tassel effect on the frame's sides adds a rich, undeniably Western finishing touch. More than just a showpiece, the frame's durable, crystal clear acrylic window protects your treasured photo or art from smudges, scratches, skin acids and environmental damage. Best of all, you won't pay anything close to antique store prices on this fine Western-themed frame, yet it easily rivals any genuine antique in style and allure! 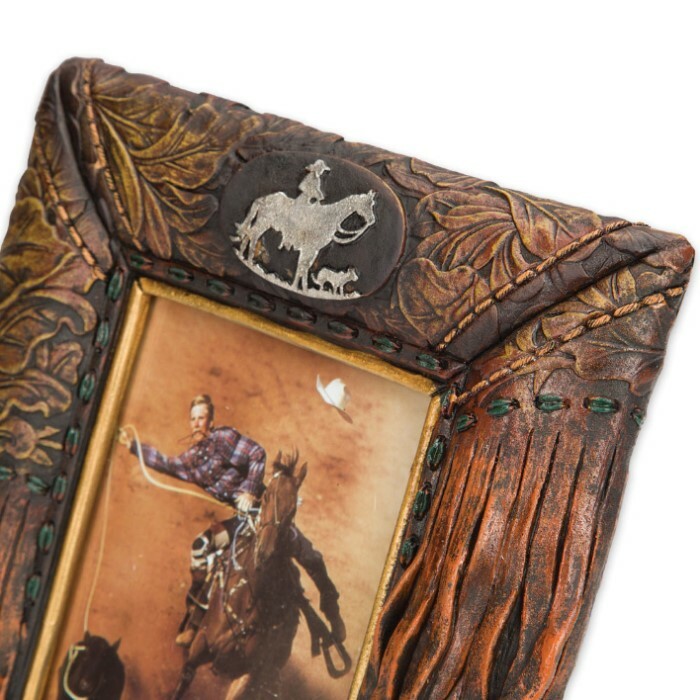 The Praying Cowboy frame also makes a superb gift for friends and family, especially when accompanied by a heartfelt photograph. It's a lovely gesture that's sure to be fondly remembered for a lifetime! I bought several of these as gifts. Everyone really LIKES them. They look like they're made of leather. A great value! I just got this for a very close friend of our families. It is awesome. Very solid, looks great. He loved it. The price is super too ! Get one , you won't believe it !